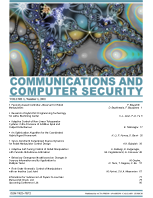 The International Journal of Communications and Computer Security is an interdisciplinary journal covering all areas of security in communications and computer systems. With the rapid growth in the necessity of communication, interaction and networking, usually through Internet access and wireless networks, the aspects of security in information systems become increasingly relevant and demanding. The scope of CCS includes: anonymization, authentication protocols, biometric security, cryptanalysis, data encryption, cloud security, digital rights and identity management, Internet and on-line social networks security, malware and bots, mobile, ubiquitous and wireless network security, medical and home-care systems security, risk communication, RFID, privacy, trust and public safety communications networks, quantum cryptography, virtual machine, VoIP and multimedia security, watermarking, web, cloud, eGovernment, eBusiness and eCommerce security.